If a smartwatch is defined by the number of features and the level of interactive intelligence built into the device, then the Samsung Gear is without a doubt the smartest smartwatch in the market right now. The Samsung Galaxy Gear is a smartwatch with non-removable strap, where the camera and speaker are built. The watch face is made of aluminium and glass curved to flush with the shape of the strap. From afar, the Galaxy Gear looks futuristic and stylishly sleek, but on close observation, I find it bulky and thick. While reviewing the unit, I was warned by a peer not to get the device wet, so I wasn’t sure how resistant it is against moisture. I suppose it should be fine getting some water splashes while washing your hand, but I would be very mindful of how I handle this device. As rugged as it may look, it is after all an all-rounded gadget. To charge the device, you need to use a charging cradle, which is connected to the Gear via a 5-pin connector located behind the watch. The cradle has a micro USB port and a built-in NFC for pairing. 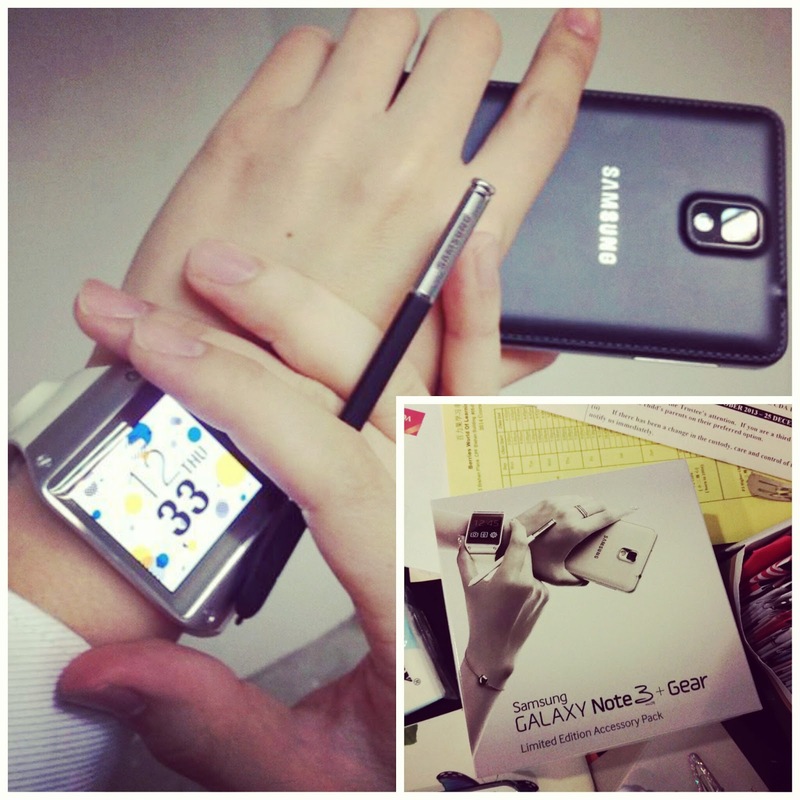 At launch, the Samsung Galaxy Gear can only be connected to the Samsung Galaxy Note 3, but soon, many Galaxy devices, with Android 4.3 update, including the S4, S3, Note 2, will have compatibility. Check Samsung website for the latest compatibility list. 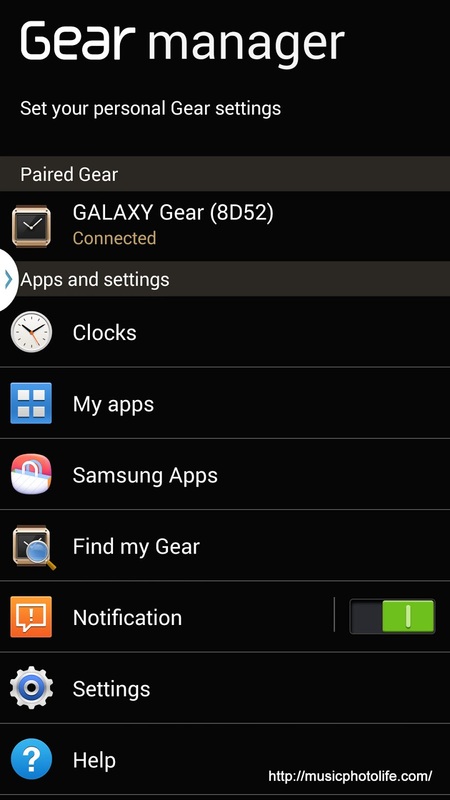 To pair the Gear to your smartphone, you have to first install the Gear Manager app in your smartphone. Do trigger the download, turn on NFC on your smartphone. Using the charging cradle alone (i.e. remove the watch from the cradle), tap the cradle on the smartphone where the NFC chip is. After the successful installation of the Gear Manager, you then proceed to pair the watch. This time round, remember to turn on Bluetooth on your smartphone, and turn on the Gear smartwatch. Tap the cradle again on the smartphone, and magically, the Gear will display a confirmation screen to accept the pairing (it’s interesting how the charging cradle is also uniquely paired to the Gear to pass the relevant hardware information to the smartphone for pairing). If the pairing is not successful, just restart both devices. Once all is well, you will be able to see the Gear Manager indicating the list of apps pre-installed on the Gear watch. You can also proceed to download other supported apps via the Samsung Apps store. As of now, it is very difficult to find third party apps for Gear, but hopefully the number of supported apps will increase over time. Banjo, Camera360, Evernote, Facebook QuickView, Glympse, Pocket, Tweet QuickView, MyFitnessPal, Vivino Wine Scanner, Path, Runtastic PRO, Life360, LINE, ChatON, eBay, TripIt, Smart Remote. You may select apps as your favourites, which will appear in the list of apps when you swipe your Gear left-right. Otherwise, all installed apps will appear under the “Apps” page. You may also apply settings of your Gear via the Gear Manager. 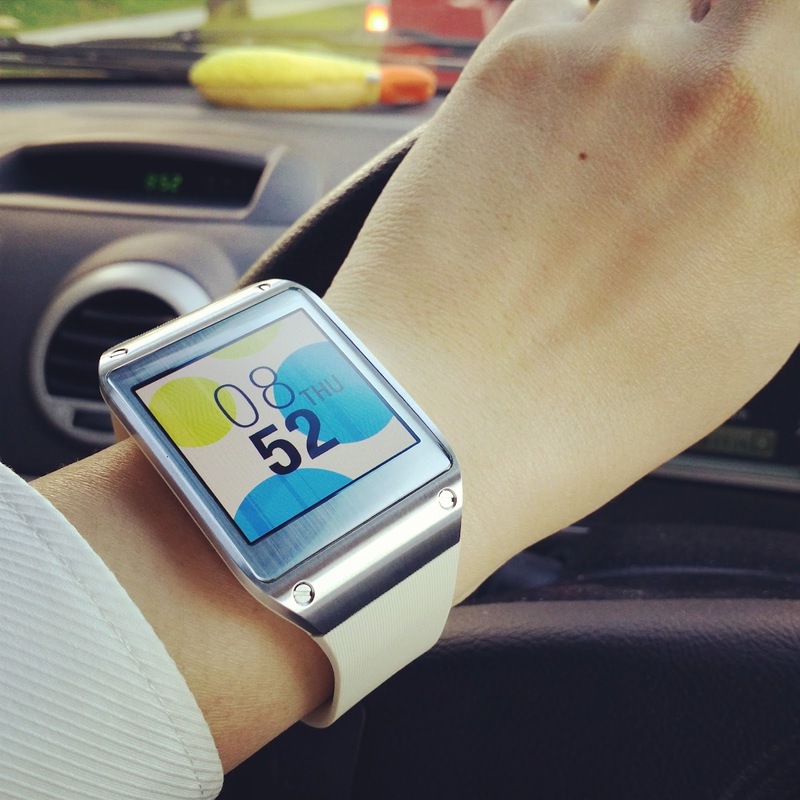 Unlike other smartwatches, the Galaxy Gear is supposed to work flawlessly with the Samsung Galaxy devices. Based on my experience, that is true. Compared to my experience with the Sony Smartwatch 2, the Galaxy Gear does not cause any apps to crash. There is only one hardware button on the Galaxy Gear, which can be programmed with single and double-press action. Press once to turn on the watch face, or enable wake-up gesture so that the watch face lights up automatically whenever you raise you hand to your eye. To operate the Galaxy Gear fluently, you need to know all the screen gestures. In the clock screen, swipe down to start the camera app, swipe up for the dial pad, or swipe left-right for the favourite apps. Other than the watch face, swipe down goes back to the previous screen. Double-tap the screen with 2 fingers to display battery remaining, adjust volume and screen display. Tap and hold 2 fingers to pull up the recent apps. The same gestures apply within the apps. There is no context menu or settings within the app unless it displays small icons on the screen for you to access. When you double-press the hardware button, by default it activates the S Voice app which lets you interact with the Gear via voice commands. You may choose other action options under the Gear Manager Settings. Unless you are in a quiet sterile environment, the S Voice may have difficulty handling your voice command, and you might have difficulty hearing the voice prompts. The speaker is positioned at the strap buckle, facing down and not towards you, so you would probably be talking to the Gear with your watch face facing away from you so that the speaker faces you. To jump back to the clock immediately from other screen, press the hardware button once, and press again to turn off the screen. The Galaxy Gear 1.63-inch 320×320 screen appears sharp and not pixelated. There are no display lags even when using the Camera app during live view. The display text are generally huge, even when I selected the smallest display font. The quality is what I would expect from Samsung. Just like the Galaxy smartphones, Samsung implemented several smart gesture-based features on the Galaxy Gear to improve intuitive interaction, and I am generally impressed with the level of thought put in to achieve them. Whenever there is an incoming notification, it will be displayed briefly on the watch face. If you have enabled “Smart Relay”, then during the period when the notification is displayed on the watch face, if you pick up your smartphone, the phone will automatically wake up and open the app so that you can view the content. The Auto Lock is another useful feature. If the Gear and your smartphone is within range, the smartphone will not require security code to unlock. Once the Gear is out of range or switched off, you will be asked to enter your security code. And if indeed the Gear and the paired smartphone are out of range, the Gear will remind you politely, in case you genuinely left behind your precious smartphone. 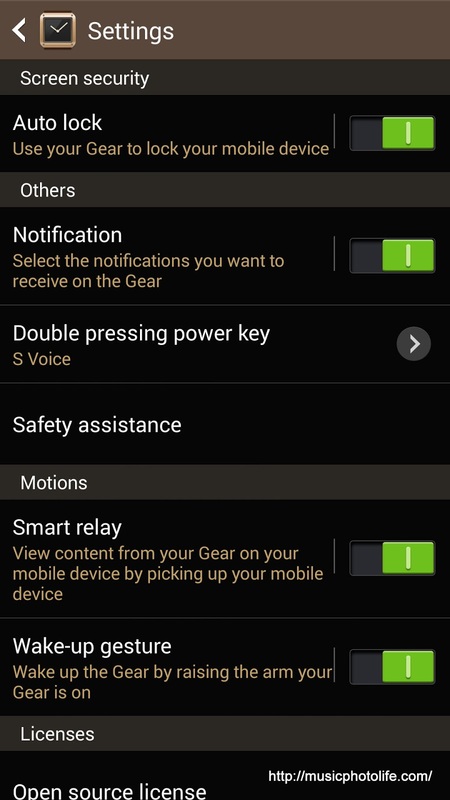 With the latest firmware update, you can select any Android notifications to be pushed to the Gear. However, the Gear will only receive notification when your smartphone screen is off. Therefore, if you are actively using the smartphone, notifications will not be pushed to the Gear. I would wish Samsung could provide an option to allow all notifications to be pushed, because sometimes I might be occupied with other activities on the smartphone (e.g. playing full-screen games), so it would be great if the Gear can still receive notifications so that I can decide whether to disrupt my on-screen activity. One saving grace: the unread notification count will be synced with your smartphone, so after you have read all the notifications from your smartphone, the Gear will clear the unread count. If you enable the wake-up gesture, the Gear will automatically light up showing the clock when you raise your arm. It only lights up if you raise your arm high enough, so it can be rather annoying if you wanted to check the time without raising your arm up, say, when you are carrying heavy grocery items. Would Samsung provide a software update to allow the clock to be on display all the time, like Sony SmartWatch, or would this feature drain too much battery to be feasible? Then of course there is the S Voice feature where you can do speech-to-text replies to messages. I am not a fan of voice commands, but if you have an accent that S Voice easily recognises, this feature will be of great benefit. One of the unique features on the Galaxy Gear is the camera, which no other smartwatches in the market possess. The quality is comparable to a front-facing camera on the Samsung Galaxy smartphone. Initially, I did not think much about the camera. I mean, why should I use the Gear camera when I have my Galaxy Note camera that is so much better quality? Little did I find that it is a lot more convenient – and faster – to activate the Gear camera to capture the fleeting moments. It also records 15-second videos. The live view has no lag, but as you tap the screen to take the picture, the camera takes a while to focus before firing the shutter. There is option to auto-transfer the files to the smartphone, or you may choose to transfer manually. In any case, the files remain in the Gear for you to browse, share or delete. The shutter sound cannot be muted, a feature probably to deter user from sneaking shots. The Galaxy Gear has a built-in pedometer which works amazingly. It detects my walking steps rather accurately, and synchronises the data with the S Health app in the Galaxy Note 3. In the spirit of safety, the Gear can be configured to send information like your GPS location to pre-defined contacts if you press the hardware button 3 times during an emergency situation. Like all smart devices, the functional capabilities are limited only by the available apps. For that, the Galaxy Gear is very lacking at this point in time. For instance, there is no Gmail or Email or Messaging app to browse from the Gear. I can only read those messages stored under notifications. I also do not fancy the Schedule app which displays only the day’s schedule, with one appointment appearing at any time, instead of a summary list. So I had to swipe left-right to review all my appointment for the day, and only for the same day. Having said that, the Galaxy Gear has a gorgeous screen, and with good app design, it will turn the Gear into a very useful tool. I have tried the Watch Styler app that lets me design the Gear clock, and it has potential to let me create pretty watch faces. The Mini Gallery app lets me browse my smartphone photos remotely, and they look decent enough on the Gear screen. If you have basic interactions with the Galaxy Gear, it could last for 2-3 days. Based on realistic usage, the battery dips to about 70% at the end of my 12-hour work day. But when I used it extensively, the Gear will drop to about 30%. Instead of risking running out of battery on the next day (who knows, I might use the Gear a lot), I would charge it daily, which is conveniently fast. How useful is a smartwatch like the Samsung Galaxy Gear? If you always have your smartphone with you all the time, then a smartwatch is definitely redundant, and in some cases, annoying. But if you leave your smartphone in your bag or frequently out-of-sight, or if you work in a noisy environment, or when you are in the gym, and if you are paranoid about missing any incoming notifications, then a smartwatch is the solution. In fact, when I carry the Gear, I could safely mute the smartphone. The Gear is a lot more useful than most smartwatches out there: without touching the smartphone, you can actually make calls with it via the handsfree speaker, or compose messages using S Voice, or take photos and videos with the camera. Having said that, the constant light-up of the watch screen during incoming notification might be distracting in a dark environment, say, movie theatre. Maybe future updates can allow on-screen notifications to be disabled. On the whole, it is a useful add-on to your mobile lifestyle. But, is it fun to use? My view is no. The Gear serves as a good-to-have extension to your mobile device, transferring some of the interactions from the mobile device to the smartwatch, like reading notification, pedometer, changing music tracks. But it does not offer the same fun factor as, say, getting a new smartphone. Like the Samsung smartphones, the Samung Galaxy Gear may be too smart for its own good. Its smart features are based on motion sensors which, unlike buttons, are not always reliable. So there will be times of frustration and disappointment that things do not work all the time. Nonetheless, we have to applaud Samsung for taking the bold lead to introduce new human technology to consumers. I believe that in time to come, when other tech giants like Apple or Google offers wearable gadgets and incorporate some of these smart features in improved forms, people will appreciate Samsung for showing us what smartwatches are capable of. P.S. Don’t miss out my review on the other smartwatch from Sony – SmartWatch 2. I will be writing another post to compare between the Sony and Samsung smartwatches: which would I prefer?